oh, adorable! congrats on finally getting her home! Ditto! Glad to see she's home now! 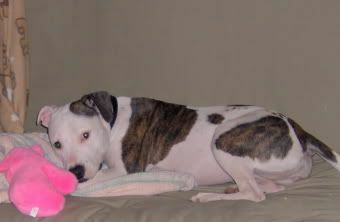 Paul- She picked out her piggy at Petsmart when we were getting her nylabone for her plane trip. She fell in love with him and started carrying him everywhere in the house. I cant believe she hasnt torn him up yet! One of Maui's first toys was that same piggy! She LOVED it! Shes had 2 or 3 since her first one, but they don't last long at all. Excuse the poor quality, that was back in my pre-digital camera days. aw yay! Im so glad to hear that others dogs had the same piggy and loved it! I talked to Paul on the phone tonite and he said him and Chloe went for over a mile walk and she walked with her piggy in her mouth the whole time!!!! Re: My heart is breaking! After 11 years I'm proud to say I gave my girl a good home and a great life. She is still fighting, but her days are numbered. She has a tumor on her spleen which ruptured the other day. She on pain meds now and I'm holding on for a couple more days, hopefully not selfishly. She's still eating, drinking and moving, so I couldn't face putting her down at the vet. I really don't know what to do. I just pray she'll pull through, but I don't think that's an option. 11 years seems like a long time, and a blink of an eye all at the same time. cherish whatever time you have left together, and take time to grieve. It's never easy to lose a family member. also, I just re-read this entire thread, and I felt like the Grinch, with my heart growing two sizes.